Headline Brussels: TV studios, camera crews and satellite trucks. Brussels, April 2015: France Télévisions has chosen Headline NFP as the new contractor to provide audiovisual facilities to its Brussels correspondents. They will be housed in new offices at the International Press Centre. Headline is also building two live TV studios at the IPC, which will be made available to the numerous broadcasters in and around the IPC, strategically located in the heart of the European quarter. With more than 20 years of experience, Headline NFP is a key player in the field of audiovisual newsgathering. 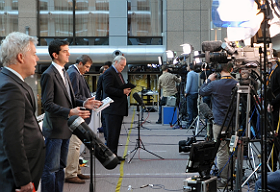 Broadcasters from all over the world rely on its services for their coverage of European news. Strategically located in Brussels, Headline NFP offers camera crews, video editing, studio facilities, satellite trucks and the assistance of a full-time production team.